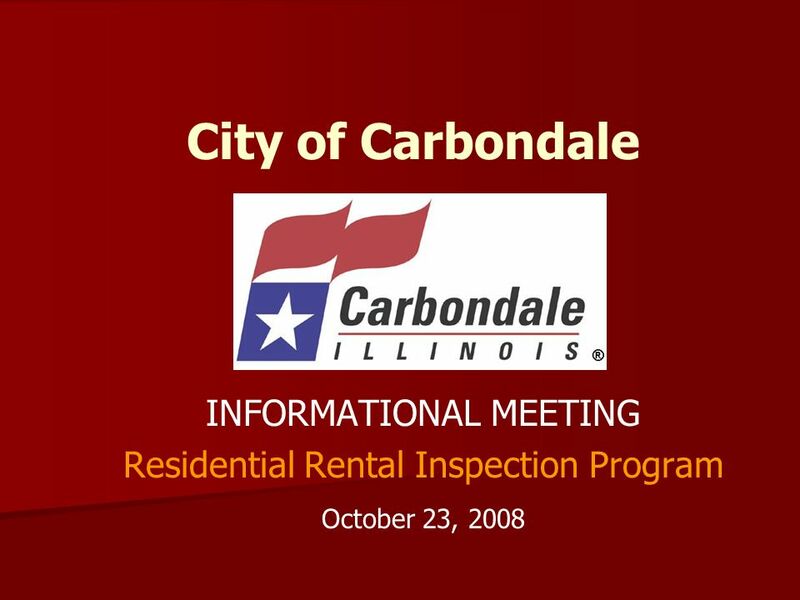 City of Carbondale INFORMATIONAL MEETING Residential Rental Inspection Program October 23, 2008. 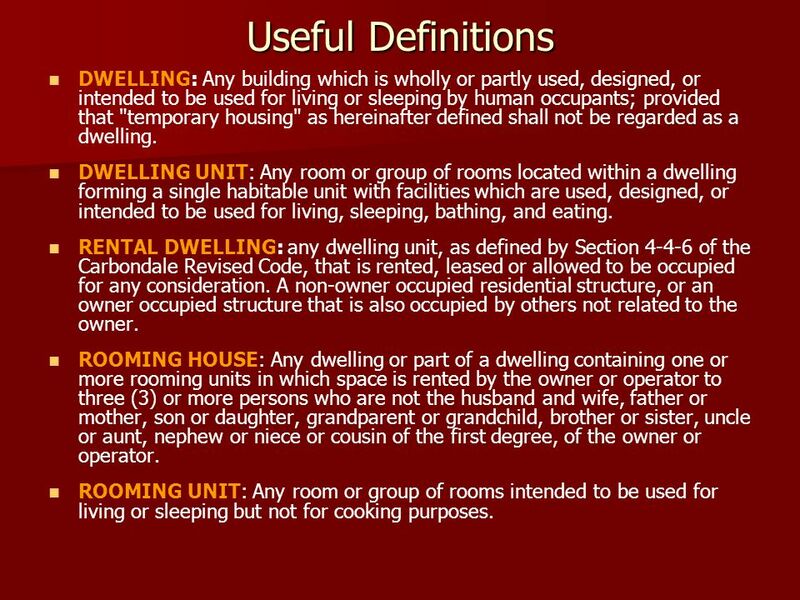 7 Useful Definitions DWELLING: Any building which is wholly or partly used, designed, or intended to be used for living or sleeping by human occupants; provided that "temporary housing" as hereinafter defined shall not be regarded as a dwelling. DWELLING UNIT: Any room or group of rooms located within a dwelling forming a single habitable unit with facilities which are used, designed, or intended to be used for living, sleeping, bathing, and eating. 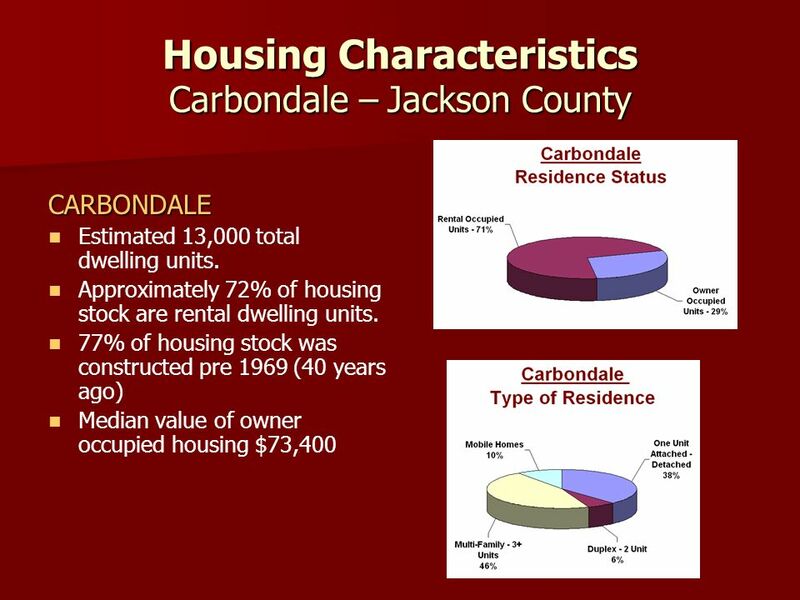 RENTAL DWELLING: any dwelling unit, as defined by Section 4-4-6 of the Carbondale Revised Code, that is rented, leased or allowed to be occupied for any consideration. A non-owner occupied residential structure, or an owner occupied structure that is also occupied by others not related to the owner. ROOMING HOUSE: Any dwelling or part of a dwelling containing one or more rooming units in which space is rented by the owner or operator to three (3) or more persons who are not the husband and wife, father or mother, son or daughter, grandparent or grandchild, brother or sister, uncle or aunt, nephew or niece or cousin of the first degree, of the owner or operator. ROOMING UNIT: Any room or group of rooms intended to be used for living or sleeping but not for cooking purposes. 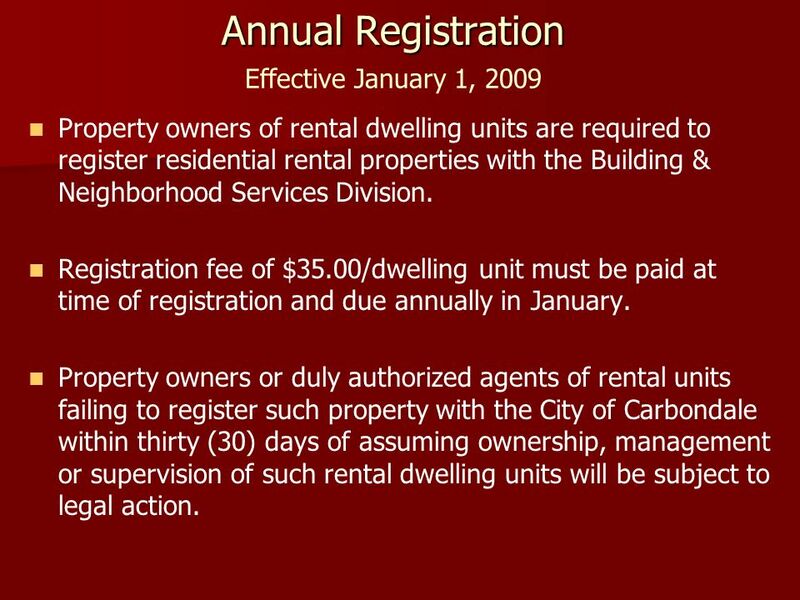 8 Annual Registration Annual Registration Effective January 1, 2009 Property owners of rental dwelling units are required to register residential rental properties with the Building & Neighborhood Services Division. Registration fee of $35.00/dwelling unit must be paid at time of registration and due annually in January. 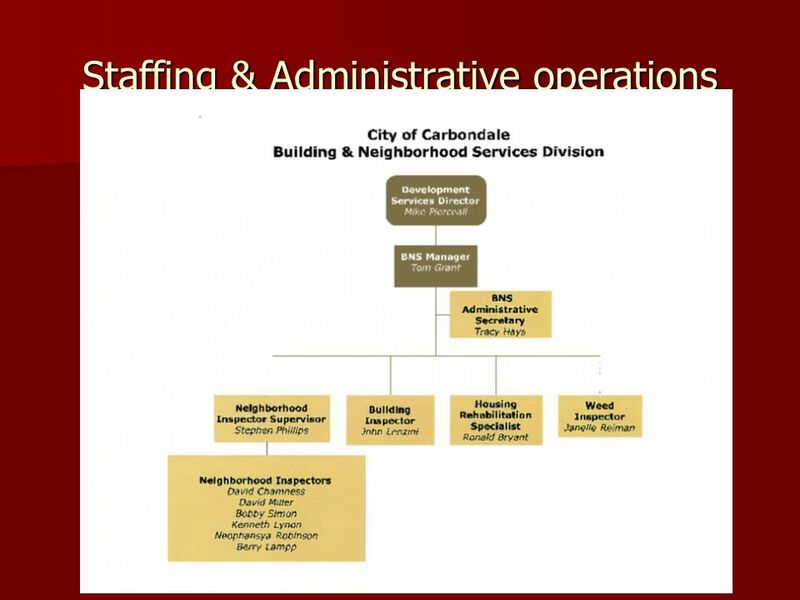 Property owners or duly authorized agents of rental units failing to register such property with the City of Carbondale within thirty (30) days of assuming ownership, management or supervision of such rental dwelling units will be subject to legal action. 9 Annual Registration (continued) Mandatory inspections will be initiated on a three year cycle or at any time a formal complaint is filed. 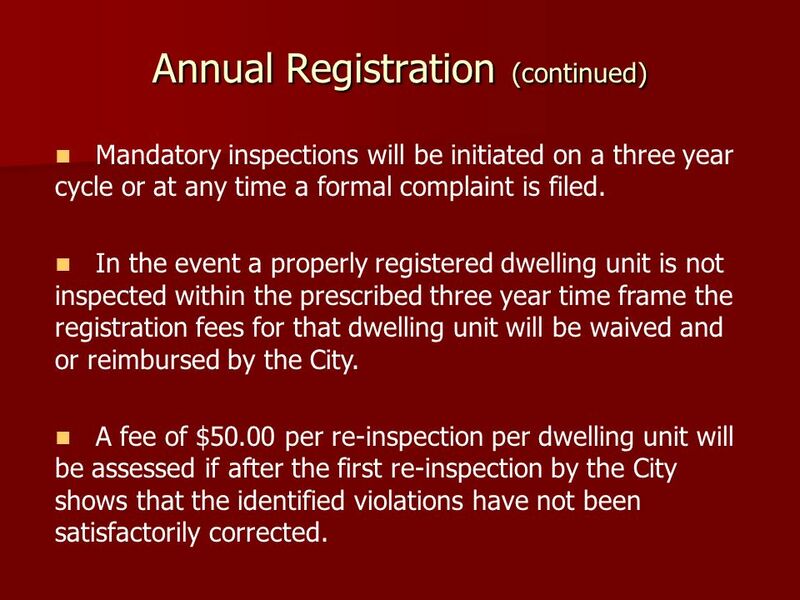 In the event a properly registered dwelling unit is not inspected within the prescribed three year time frame the registration fees for that dwelling unit will be waived and or reimbursed by the City. 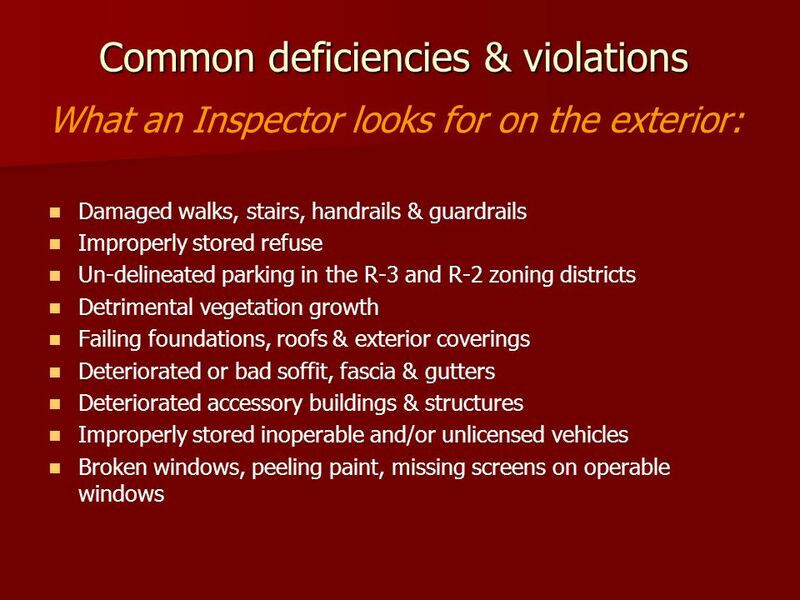 A fee of $50.00 per re-inspection per dwelling unit will be assessed if after the first re-inspection by the City shows that the identified violations have not been satisfactorily corrected. 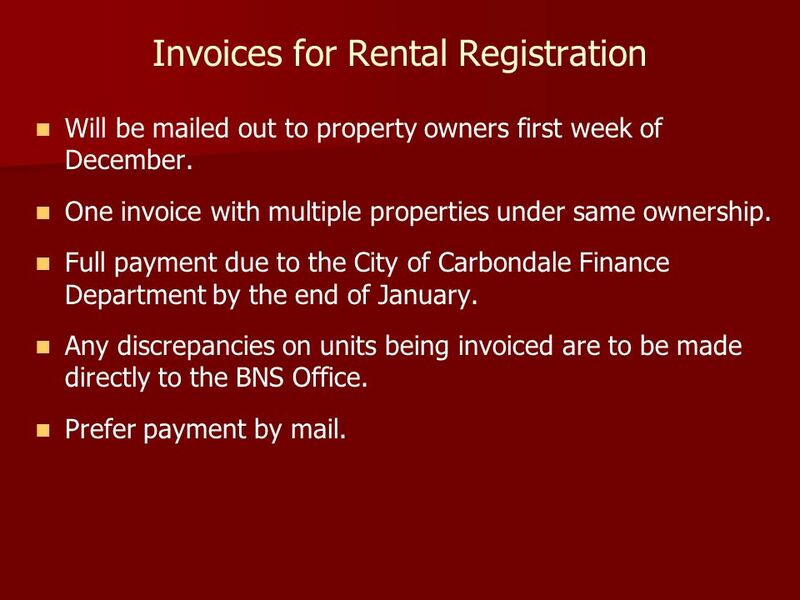 10 Invoices for Rental Registration Will be mailed out to property owners first week of December. 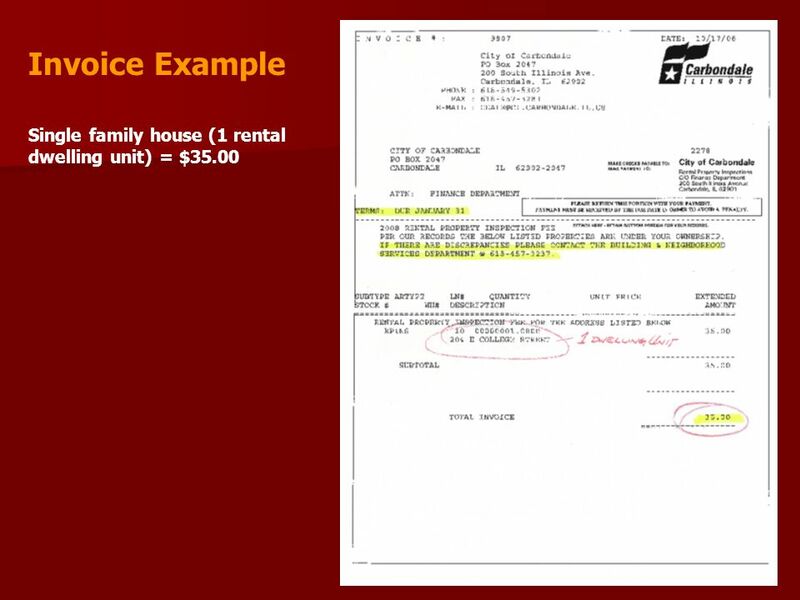 One invoice with multiple properties under same ownership. 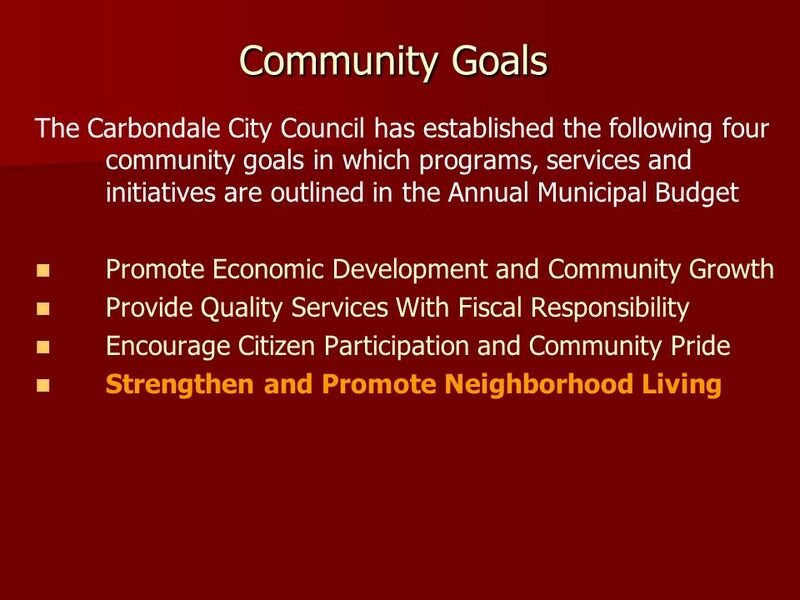 Full payment due to the City of Carbondale Finance Department by the end of January. 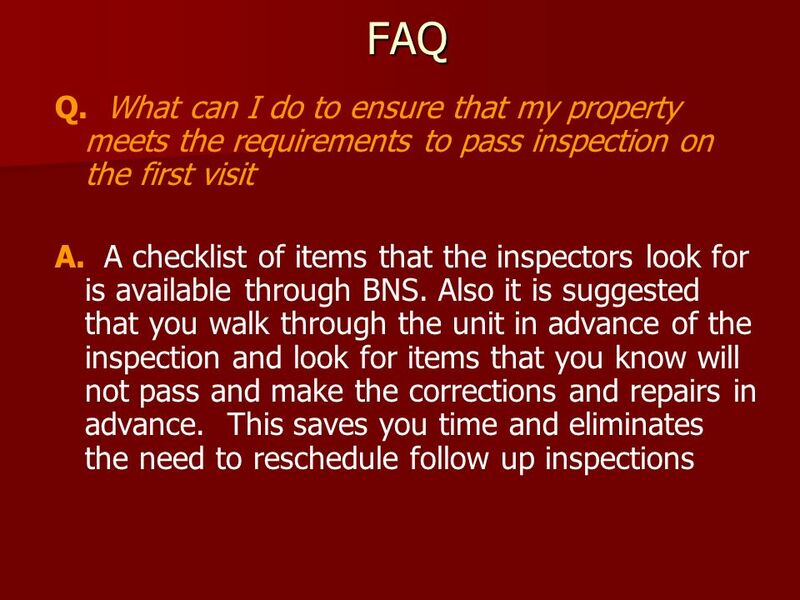 Any discrepancies on units being invoiced are to be made directly to the BNS Office. Prefer payment by mail. 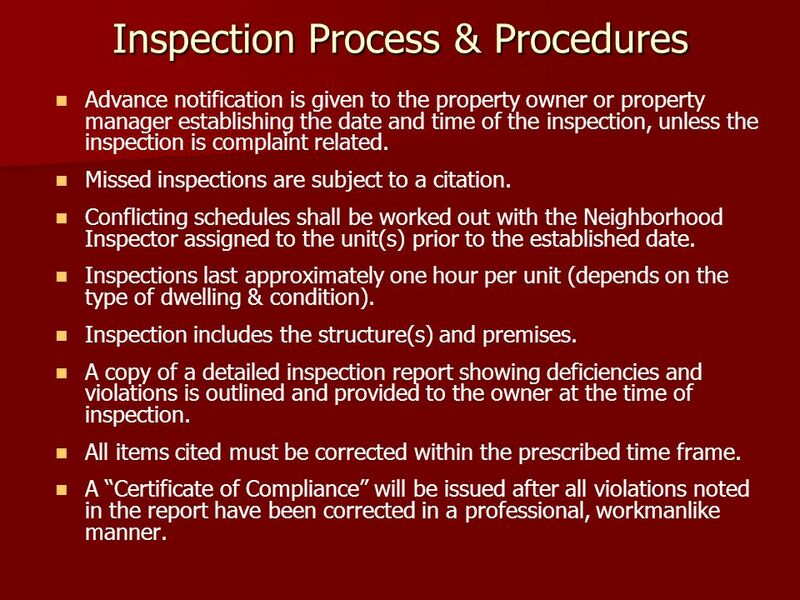 13 Inspection Process & Procedures Advance notification is given to the property owner or property manager establishing the date and time of the inspection, unless the inspection is complaint related. Missed inspections are subject to a citation. Conflicting schedules shall be worked out with the Neighborhood Inspector assigned to the unit(s) prior to the established date. 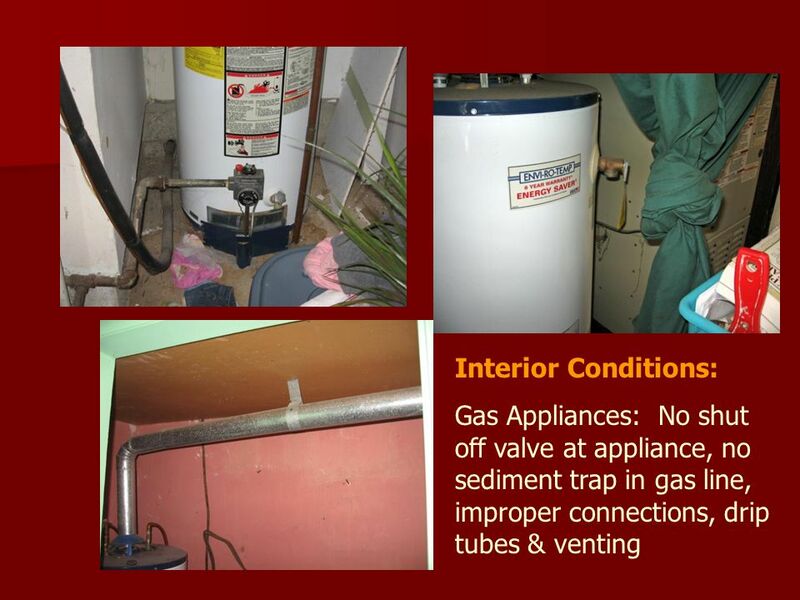 Inspections last approximately one hour per unit (depends on the type of dwelling & condition). Inspection includes the structure(s) and premises. 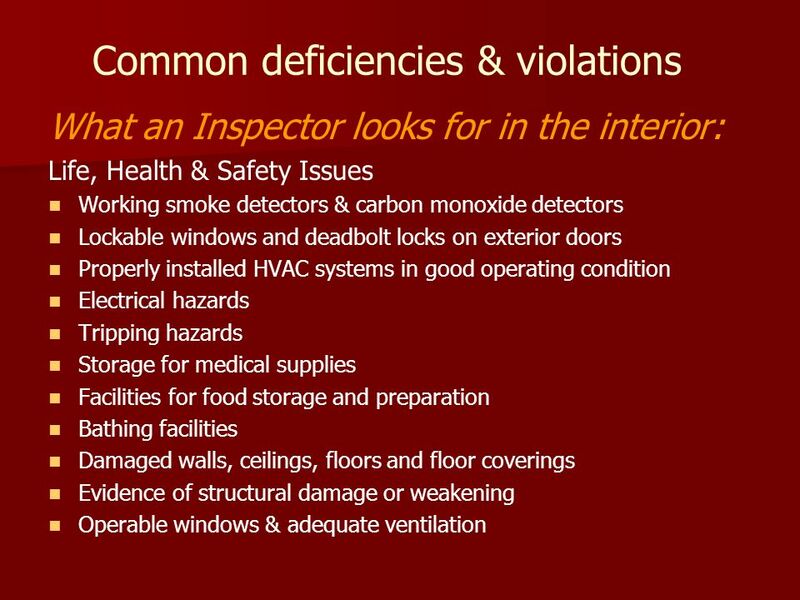 A copy of a detailed inspection report showing deficiencies and violations is outlined and provided to the owner at the time of inspection. All items cited must be corrected within the prescribed time frame. A Certificate of Compliance will be issued after all violations noted in the report have been corrected in a professional, workmanlike manner. 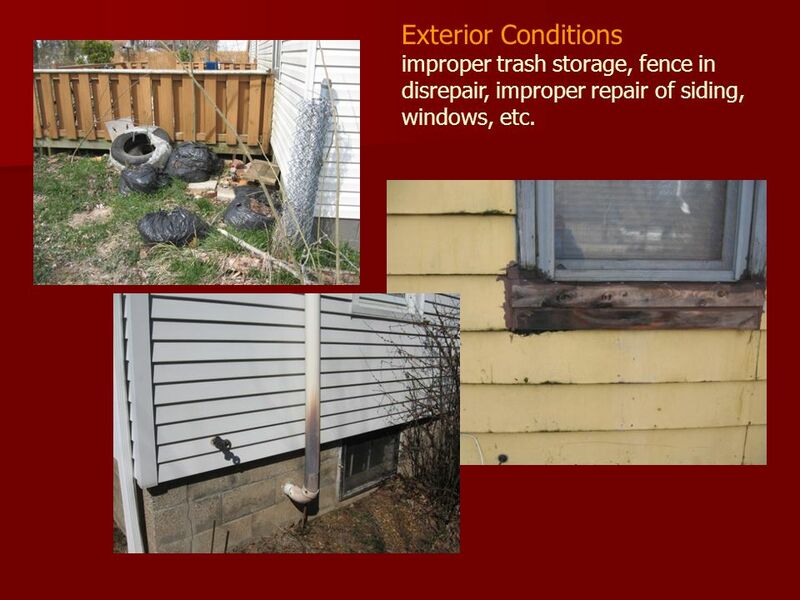 15 Exterior Conditions improper trash storage, fence in disrepair, improper repair of siding, windows, etc. 22 Whos Responsible ? 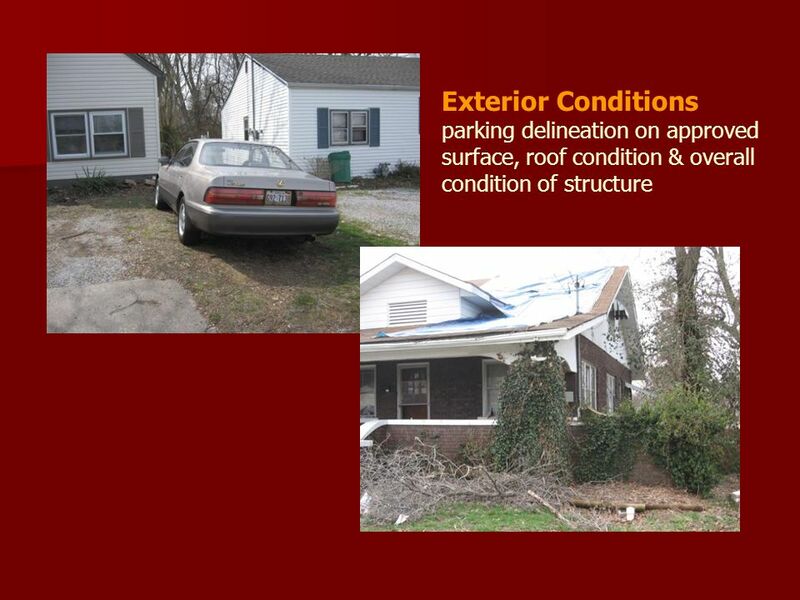 Owner(s) of a premises shall maintain The structure(s) and exterior property in compliance with the requirements of the 2003 Edition of the International Property Maintenance Code and City of Carbondale Ordinances; the most restrictive of the two shall apply. A person shall not occupy as owner-occupant or permit another person to occupy premises which are not in a sanitary and safe condition and which do not comply with the above stated requirements. 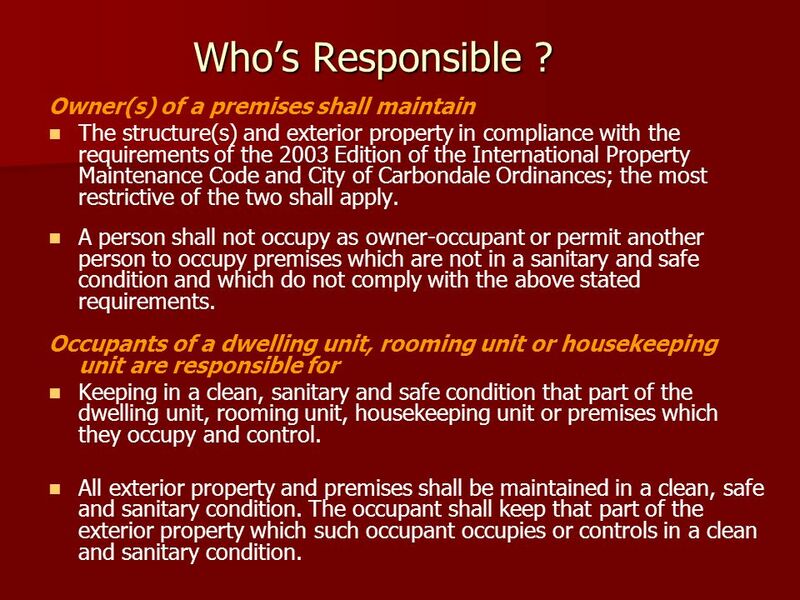 Occupants of a dwelling unit, rooming unit or housekeeping unit are responsible for Keeping in a clean, sanitary and safe condition that part of the dwelling unit, rooming unit, housekeeping unit or premises which they occupy and control. 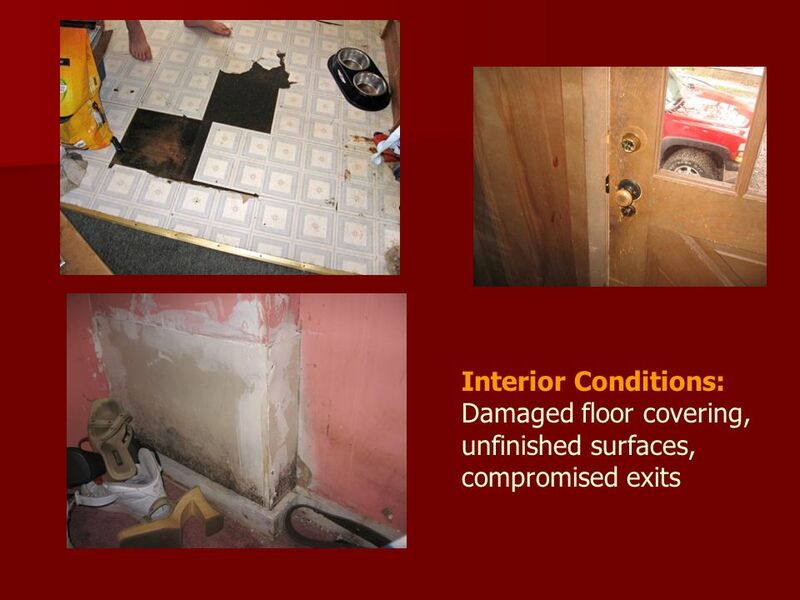 All exterior property and premises shall be maintained in a clean, safe and sanitary condition. The occupant shall keep that part of the exterior property which such occupant occupies or controls in a clean and sanitary condition. 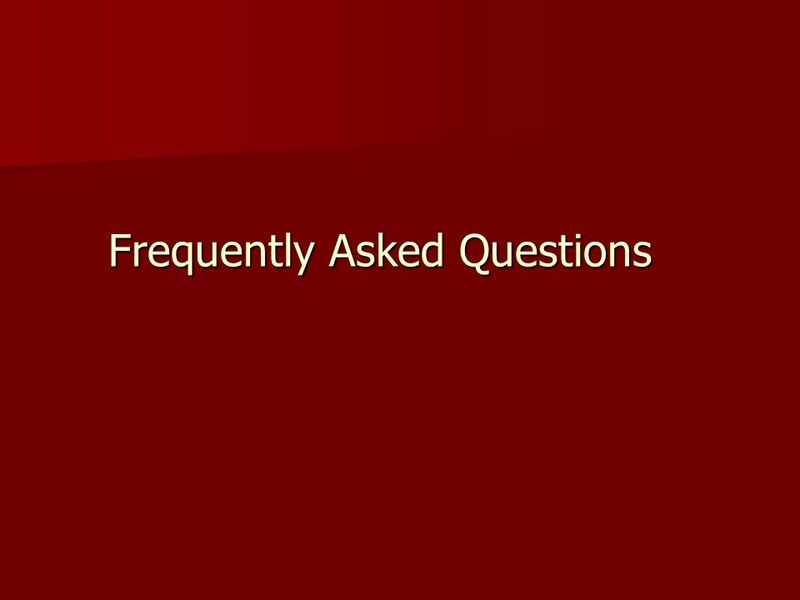 24 FAQ Q. 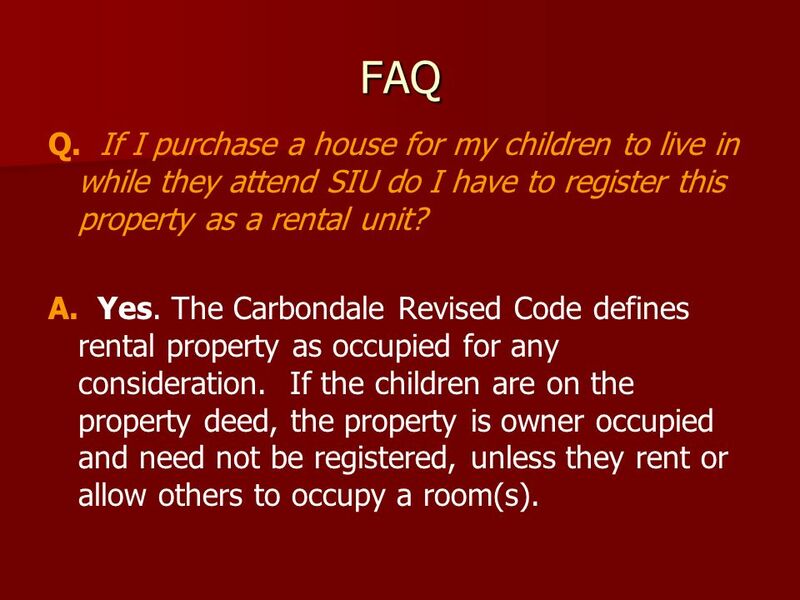 If I purchase a house for my children to live in while they attend SIU do I have to register this property as a rental unit? A. Yes. 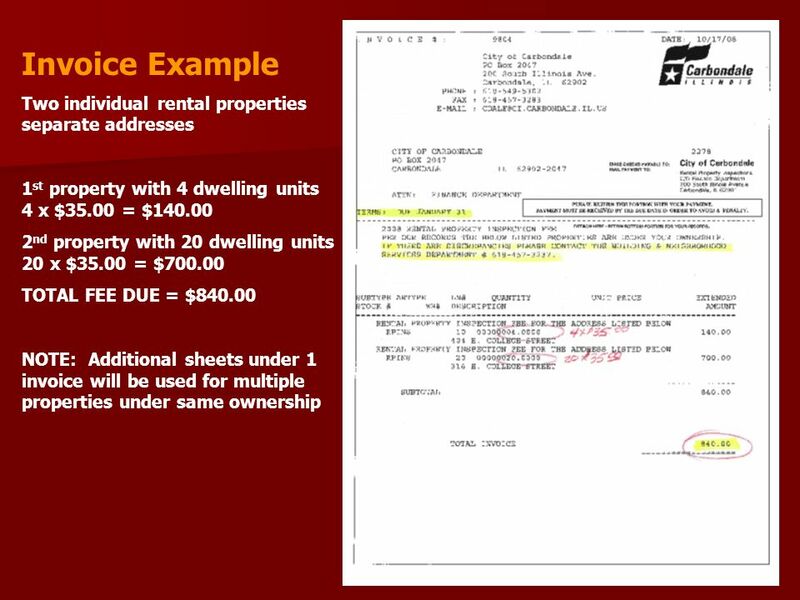 The Carbondale Revised Code defines rental property as occupied for any consideration. If the children are on the property deed, the property is owner occupied and need not be registered, unless they rent or allow others to occupy a room(s). 25 FAQ Q. What if I rent a room in my house to someone, is my house considered a rental? A. Yes. 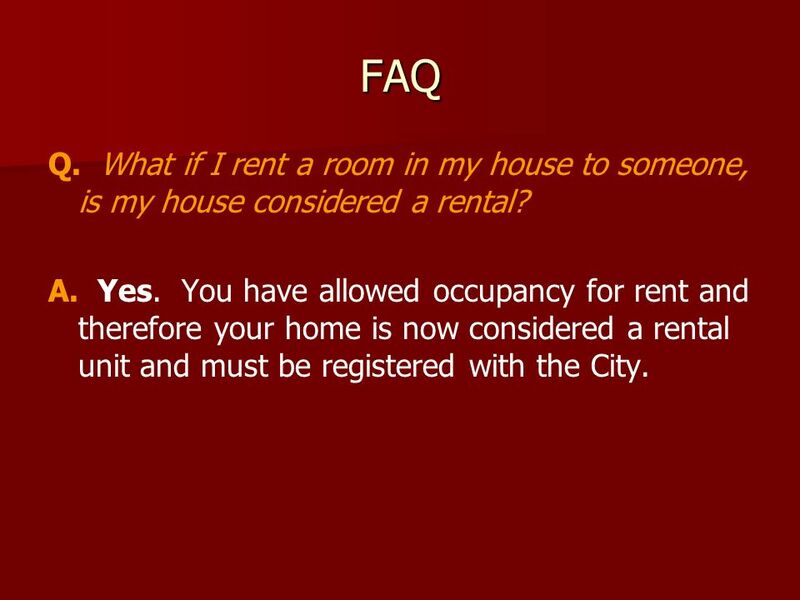 You have allowed occupancy for rent and therefore your home is now considered a rental unit and must be registered with the City. 26 FAQ Q. Why are smoke detectors & carbon monoxide detectors important? A. 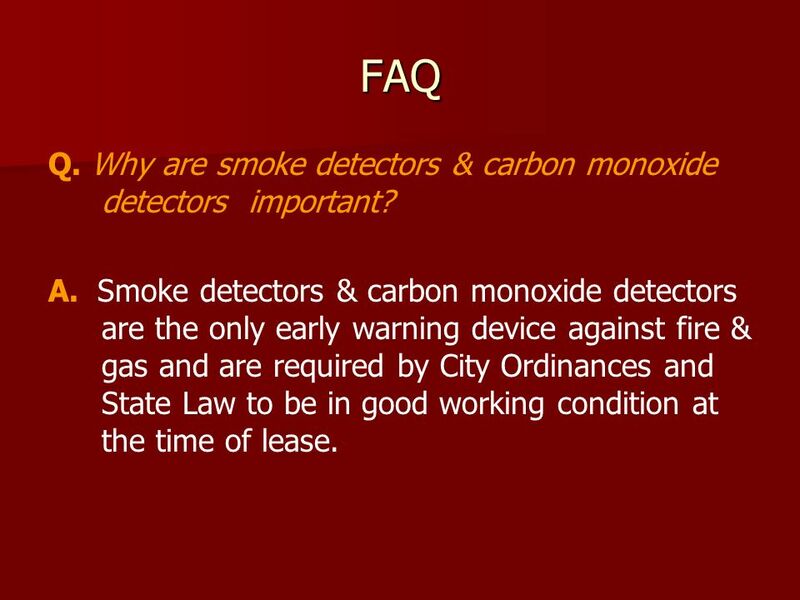 Smoke detectors & carbon monoxide detectors are the only early warning device against fire & gas and are required by City Ordinances and State Law to be in good working condition at the time of lease. 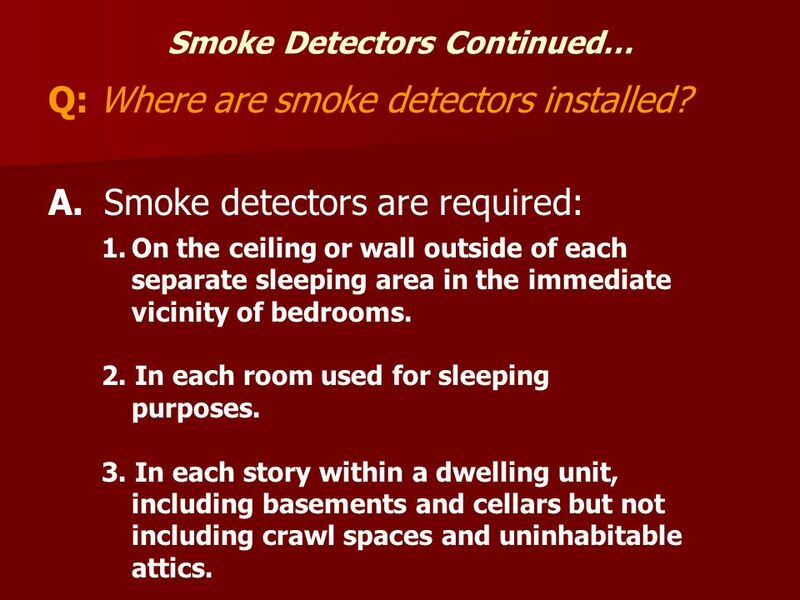 27 Smoke Detectors Continued… Q: Where are smoke detectors installed? A. Smoke detectors are required: 1.On the ceiling or wall outside of each separate sleeping area in the immediate vicinity of bedrooms. 2. In each room used for sleeping purposes. 3. In each story within a dwelling unit, including basements and cellars but not including crawl spaces and uninhabitable attics. 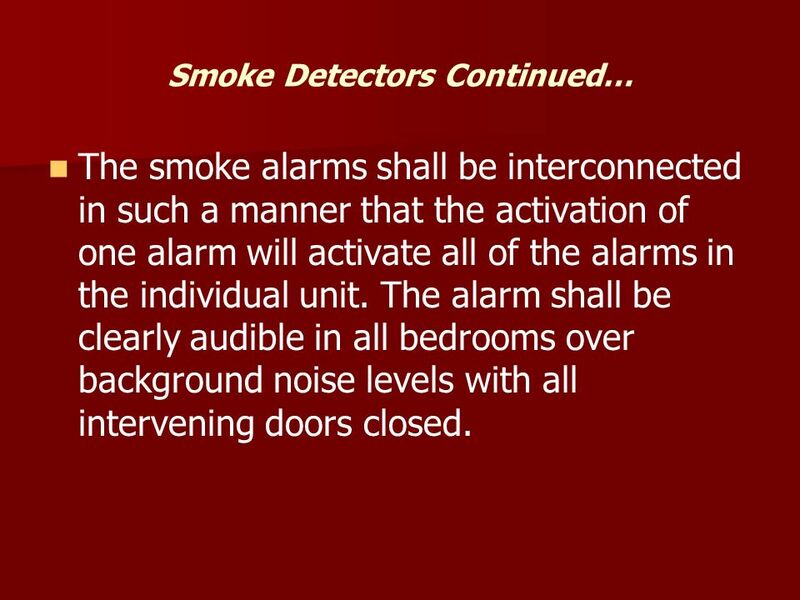 28 Smoke Detectors Continued… The smoke alarms shall be interconnected in such a manner that the activation of one alarm will activate all of the alarms in the individual unit. The alarm shall be clearly audible in all bedrooms over background noise levels with all intervening doors closed. 29 FAQ Q. What can be done about a problem tenant? A. 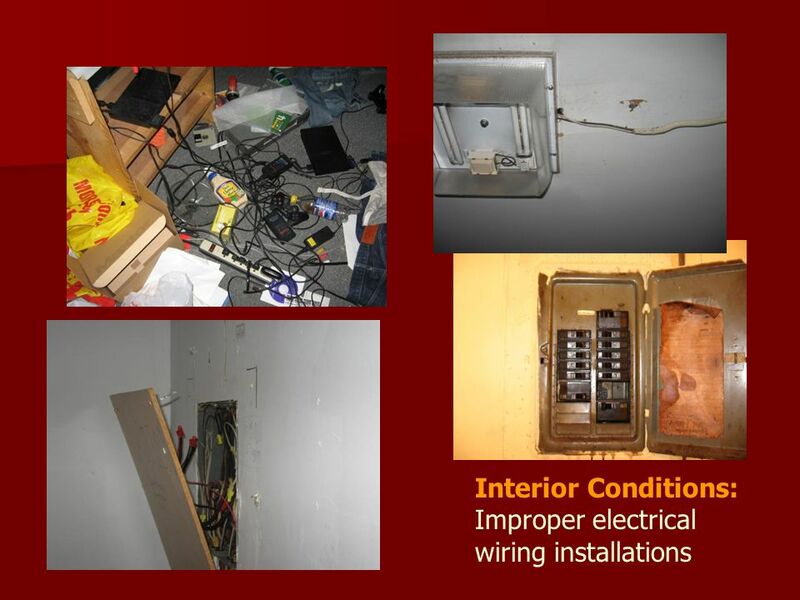 In 2003 the City Adopted the International Property Maintenance Code which puts responsibility for keeping the property in a Safe and Sanitary manner on the Tenant. *The city cannot assist in landlord/tenant disputes such as nonpayment of rent. 31 FAQ Q. What about exterior painting of my property if the inspection is done in the middle of winter? A. 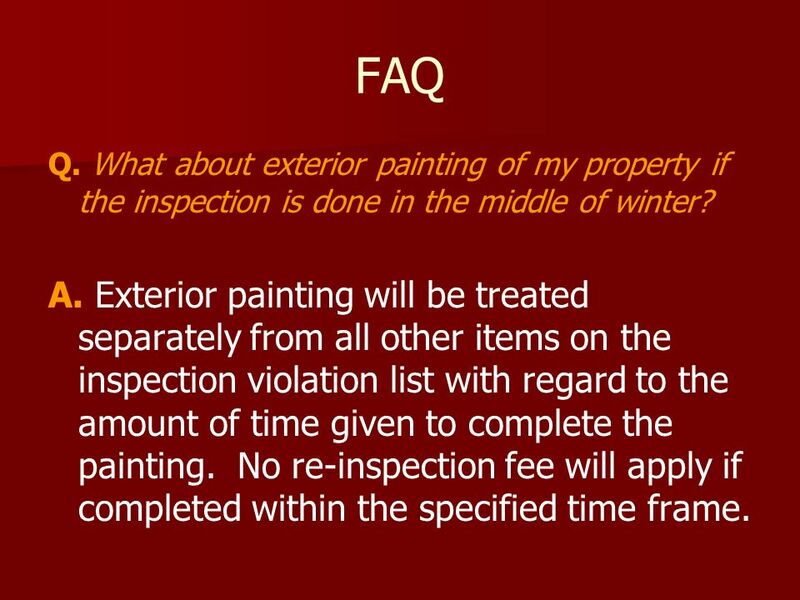 Exterior painting will be treated separately from all other items on the inspection violation list with regard to the amount of time given to complete the painting. No re-inspection fee will apply if completed within the specified time frame. 32 FAQ Q. If I sell my property during the year will I receive a refund of the prorated portion of the year? A. No. 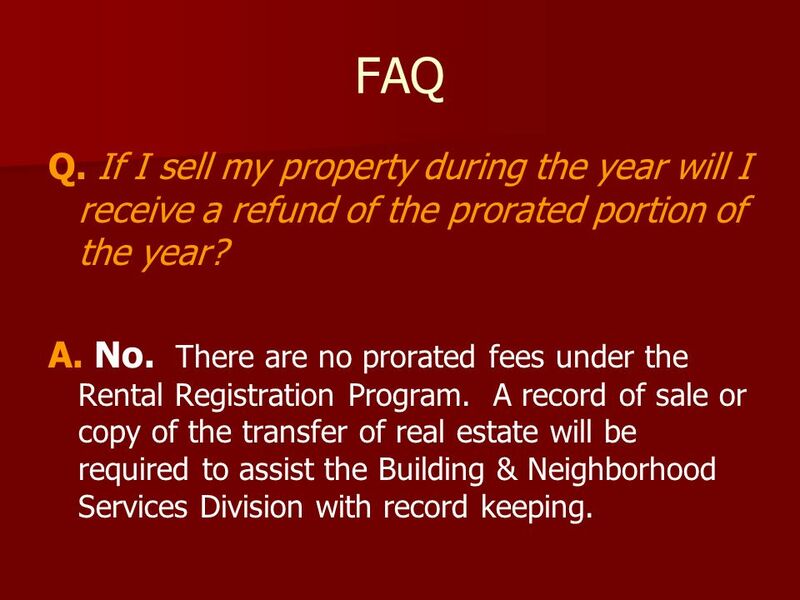 There are no prorated fees under the Rental Registration Program. A record of sale or copy of the transfer of real estate will be required to assist the Building & Neighborhood Services Division with record keeping. 33 FAQ Q. If I purchase a property mid-year do I pay the entire $35 fee at the time of registration? A. Yes. 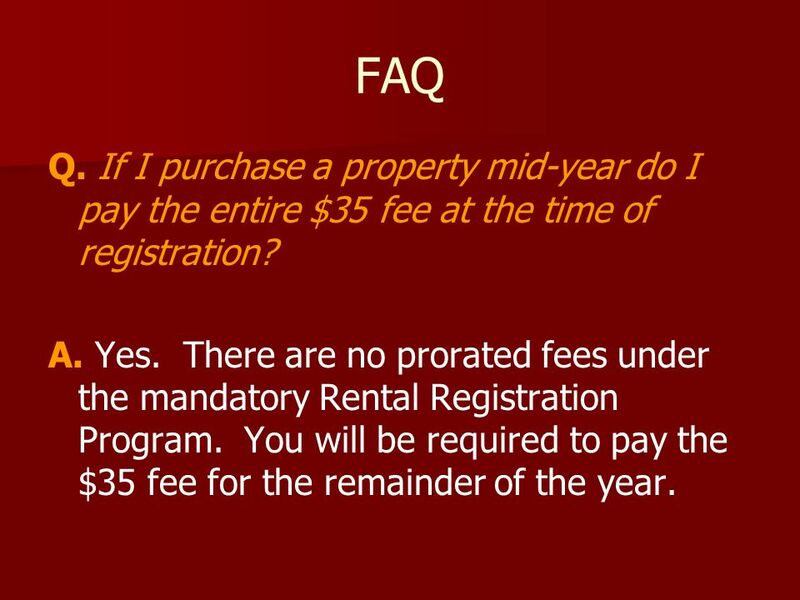 There are no prorated fees under the mandatory Rental Registration Program. You will be required to pay the $35 fee for the remainder of the year. 34 FAQ Q. If I close a property and secure it (board up the structure) do I have to still pay an annual registration fee? A. 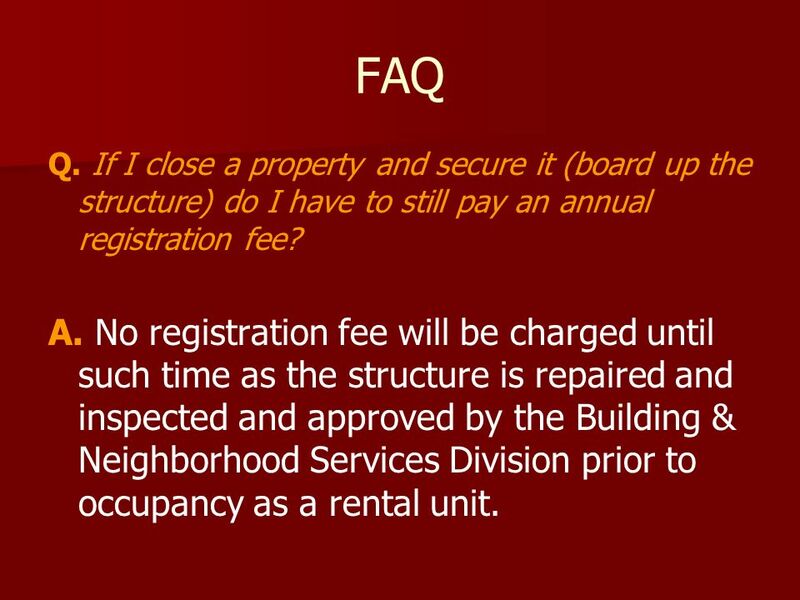 No registration fee will be charged until such time as the structure is repaired and inspected and approved by the Building & Neighborhood Services Division prior to occupancy as a rental unit. 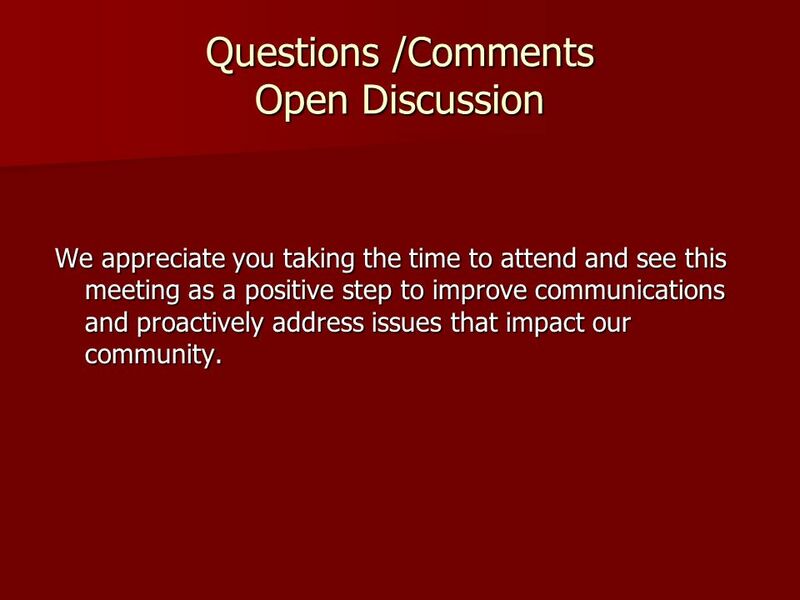 35 Questions /Comments Open Discussion We appreciate you taking the time to attend and see this meeting as a positive step to improve communications and proactively address issues that impact our community. 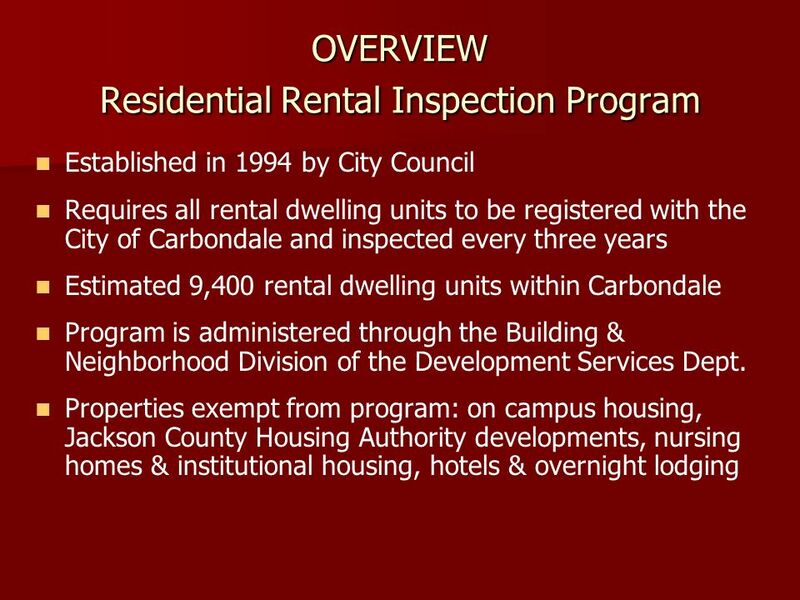 Download ppt "City of Carbondale INFORMATIONAL MEETING Residential Rental Inspection Program October 23, 2008." Landlord Workshop. 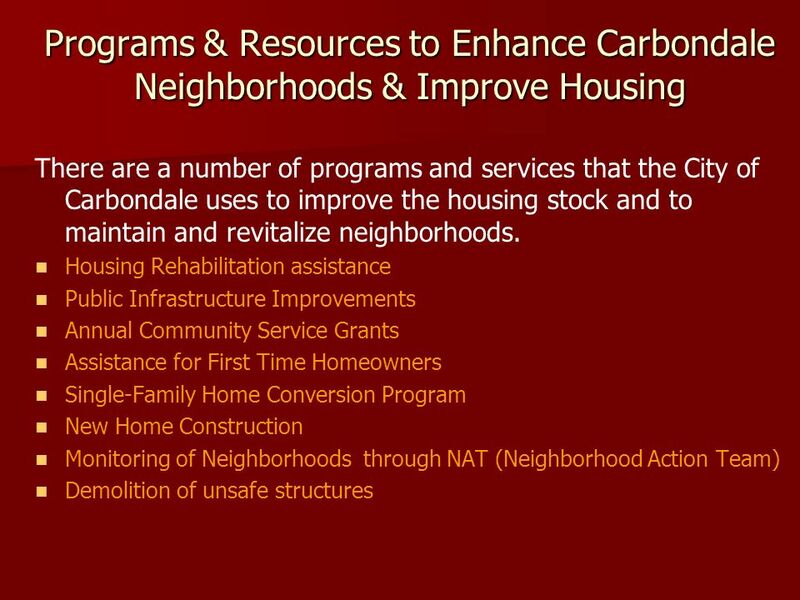 Introduction The City of Miami, Department of Community Development administers funding for two Rental Assistance Programs: HAP Section. 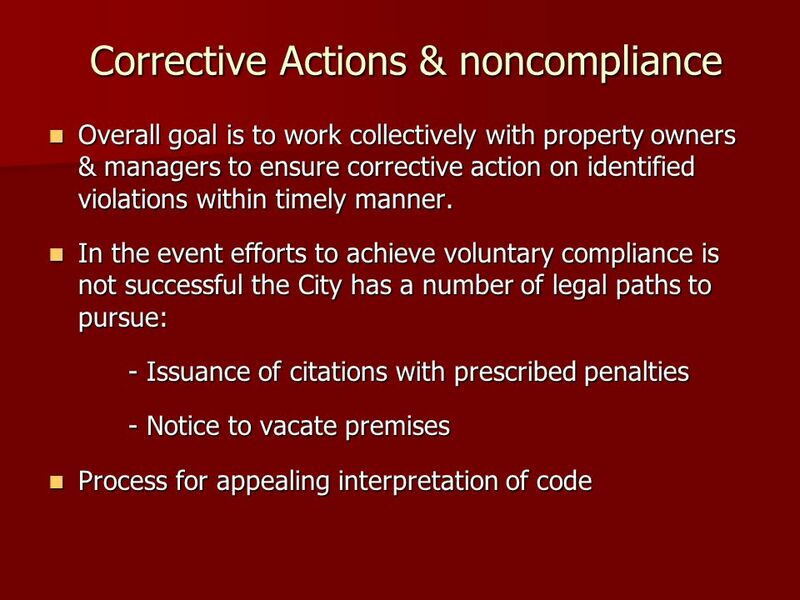 Property Painting Rule: EPAs Renovation, Repair, and Painting Rule: Guidelines for Property Managers. DECEMBER 7, 2011 HOUSING DECISIONS. AGENDA Review Decision Making Model Vocabulary Marketing strategies that affect our spending Housing alternatives. Tenants’ Union of Tasmania Inc. Lesson Two Beginning a Tenancy. “Fires in improperly secured vacant or abandoned buildings are a constant threat to firefighters, citizens and private property alike. We believe that. City of South Euclid. Hidden Dangers How do structures become vacant?  Foreclosure  Bank Walk-Away  Owner abandons property  Owner dies; no heirs. Renting a Residence. Housing Alternatives You will soon have to make a choice about where to live. You may choose to get a job, live at home with your. RSO & Relocation December What Does Rent Stabilization Do? Controls rents (Vacancy decontrol) Limits evictions (12 Legal Reasons) Requires relocation. 1 ARE 306Unit 15 Tenancies. 2 Definitions l Lessee l Lessor l Rent. INSPECTIONS WORKSHOP July 18, 2014 CMHA HOUSING CHOICE VOUCHER PROGRAM. Housing and Residential Communities Off Campus Resources. Visitors Guide to Housing in Ithaca. What is a lease? A Lease is a legal document. It protects the owners investment and tenants rights. Without a lease. Renting a Home Interior Design Copyright © Texas Education Agency,2011. All rights reserved.”. 1. Chapter 21 Renting a Residence. Housing Alternatives in College On-Campus Housing     Off-Campus Housing  Residential Campuses   Commuter Campuses. Farmworker Housing Inspections Unit 3: Conducting the Inspection. © Family Economics & Financial Education – November 2005 – Housing Unit – Securing a Living Space Funded by a grant from Take Charge America, Inc. to the.